May 30, 9 PM Update: As a check on the temperature estimate methodology described in the previous update, the same procedure was applied to a set of 247 stations for the month of April. 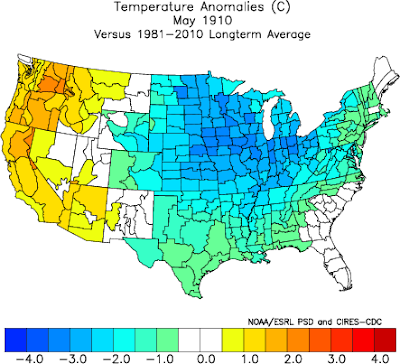 The result was only 0.1°F different from the official U.S. April average from NCDC. 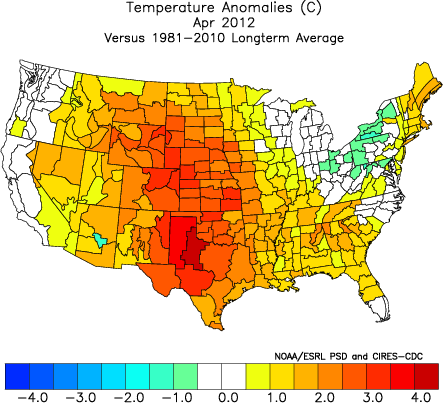 In order to estimate a numerical value for the national average May temperature departure, CapitalClimate compiled the weekly average temperature departures from normal for the 4 weeks ending May 27 at 215 major National Weather Service weather reporting locations across the 48 contiguous states. The final figures from the National Climatic Data Center (NCDC) will include many more stations and adjust for geographical distribution, but the estimate indicates a 4-week average of 4°F above normal. 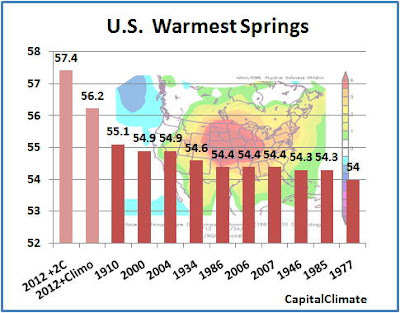 Even with somewhat cooler temperatures for the last 4 days of the month, it appears that the final spring average will come in at the high end of the range of estimates in the original post (near the "2012+2C" figure of 57.4°). As suggested last week, the U.S. is well on its way to crush the record for warmest spring since national temperature data began in 1895. 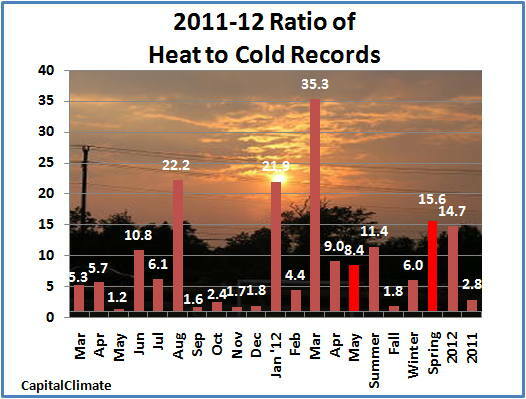 Here's an indication of just how far that record could go. 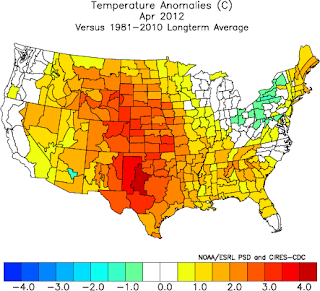 The previous record spring in 1910 had a national average temperature of 55.1°. 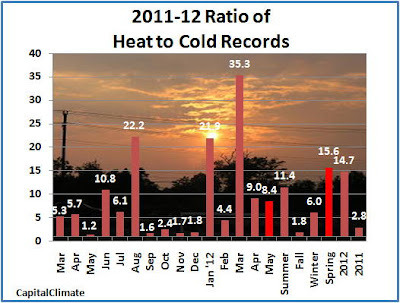 However, the March 2012 temperature exceeded March 1910 by 0.5° to set a new record for the month. 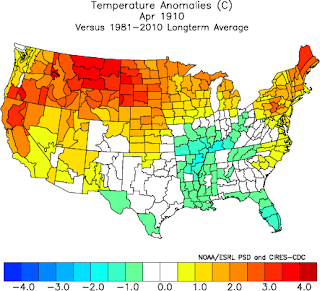 April 2012 then exceeded April 1910 by 1° (see the charts to the right). Note that the chart is in °C. Nearly all of the country is above average, with large areas over 2°C higher. How did May 1910 compare? Most of the country was below average. In fact, May 1910 was 1.8°F below the 1981-2010 average overall. If the last 7 days of the month completely reversed the May 1-24 pattern shown above so that May averaged equal to the climatological mean, Spring 2012 would still be 1.1° warmer than the old record, as big a margin as the difference between the current record and the 10th place year of 1977. If May averages as much as 2°C above climatology, which looks quite plausible, the spring average would be an eye-popping 2.3°F above the old record (see the chart at the top of the post).